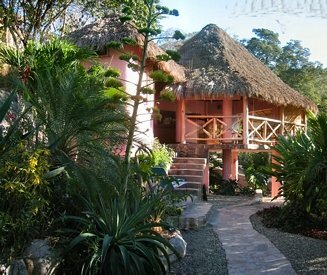 Open style palapa home with a one bedroom guest house. There is also a garage construction with a foundation for a two level ocean view guest house to be constructed above it. Located on 400 square meters of land on the hill above town with a beautiful ocean view. Only a 5 minute walk to the beach. Living area with cool breezes and a beautiful ocean view. You may need to use the scroll bar at the bottom of the window to see the entire photograph.